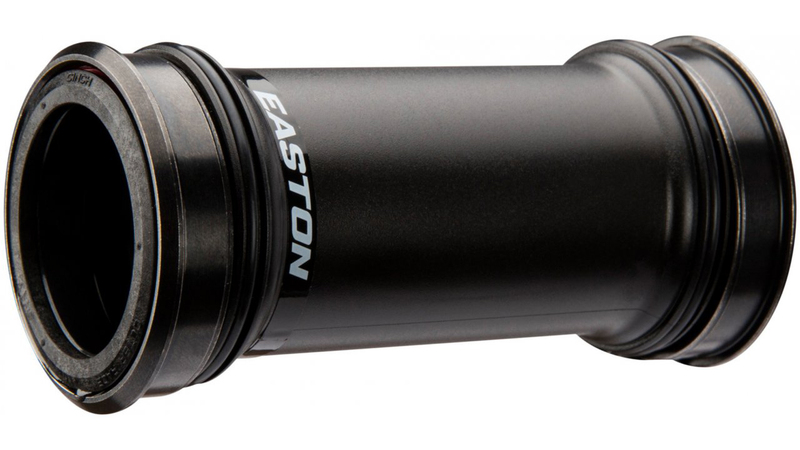 Bottom Brackets are an essential part of the bicycle that is often overlooked and forgotten, but Easton saw the BB as another opportunity for performance gains and improved efficiency. Typically with any bearing there is a tradeoff between protecting the bearing internals for longevity and bearing seal drag which impact efficiency. For their new BB they have developed a seal that achieves a very low level of seal drag while still retaining excellent protection qualities. Easton’s in-house testing procedure included developing a 24 hour continuous water invasion test, essentially pouring water into the side of the spinning bearings for an entire day continuously. And their new seal proved to have excellent contaminant exclusion. Combining those results with extensive real-world testing, they are confident of the seal’s performance and overall BB durability while being impressed by the overall efficiency. Easton then used a new thinner and low viscosity bearing grease and modified the percentage of grease fill to again find the perfect balance between durability and minimized running friction. They found that a thinner grease, with the correct fill level, was more durable than a thicker grease when spinning at high speed. A thicker lubricant under the centrifugal force would be thrown to the outer bearing race where it would stick and not return to the inner race under lower speeds, leaving it susceptible to increased operating temperatures and higher wear. If you’re running the best crankset on the market, you should have the performance BB to match. Improved bearing seal for maximum protection and less drag. Stainless steel bearings for durability. 386 EVO 46mm pressfit, 30mm spindle.